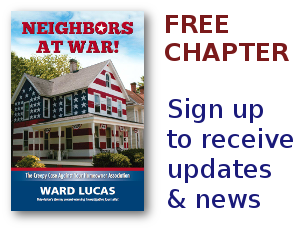 HOA corruption Archives - Page 168 of 168 - Neighbors at War! There’s not much to do in Wellington, Colorado. It sits on the dusty plains of Eastern Colorado on the border with Wyoming, surrounded by corn and sugar beet fields. It’s an inordinately boring town that features a couple of local coyote packs, a small school, and an occasional June tornado that rips off some shingles and sometimes tips over an unwary cow. Sometimes a high school scandal erupts about which girl is going to be going away for little while to resume her high school education at another school or other time. Such high school diversions have caused titters and tutters among the local townsfolks for generations. It’s none of their business, of course, but in a small town such things are everyone’s business. Damn the nosy, but that’s about all the outrage that can really be raised. Investigators of HOA corruption in Las Vegas have scored another bit hit. They have indicted a Bevery Hills man for felony embezzlement and theft. The indicment accuses Massoud Aaron Yashouafar of stealing more than a million dollars from the Paradise Spa Homeowners Association. Yashouafar was the treasurer of the HOA. In the past two years, two fires have erupted in the complex in Las Vegas. Insurance companies gave Yashouafar up to a million dollars to repair the damage. But owners of units in the complex say they never received any insurance money, and to this day Paradise spa is marred by the two fires.